Graduation from high school is a milestone that is filled with celebration of a chapter in life closing and a new one beginning. To help make this as smooth as possible below is listed some key information to know for this special day. There is no limit on the number of guests a student may invite to graduation. No tickets are needed for guests. *Please note there is no air conditioning in the arena, so dress accordingly. Designated parking is available to the north of the Weede Building with an entrance near the parking area. There is also designated seating available in the arena. Students and faculty are asked to park at the Plaster Center and enter through the south doors into the Plaster Center. Guests are to park at the Bicknell Family Center for the Arts or any of the parking areas to the west. 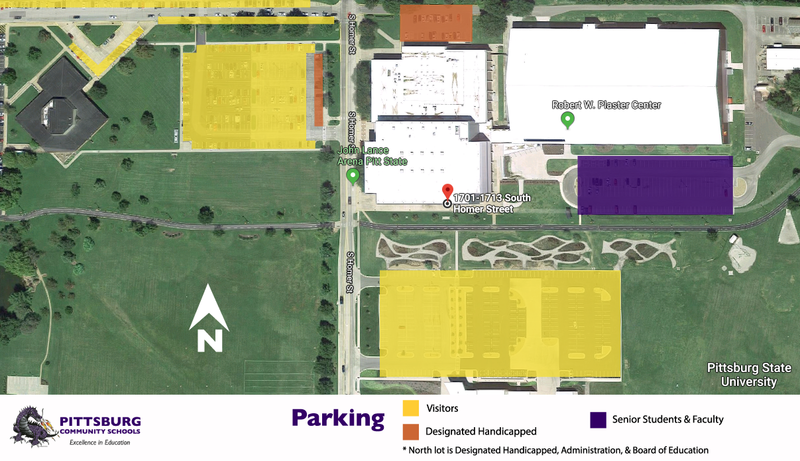 Handicapped parking is designated to the north of the Weede Building and along the first row of the arena parking to the west of the Weede Building. For more information, please contact Pittsburg High School at 620-235-3200.